In this blog post, I am going to let you know about how to create the Ad Unit in Google Adsense? Once your Google Adsense account is approved, you are ready to create your Ad Unit and paste into your website, and then advertising will start to come on your website. If you have not approved your Google Adsense account or have some difficulty for the same then you can go through the below extensive blog link for step by step procedure to approve the Google Adsense account. 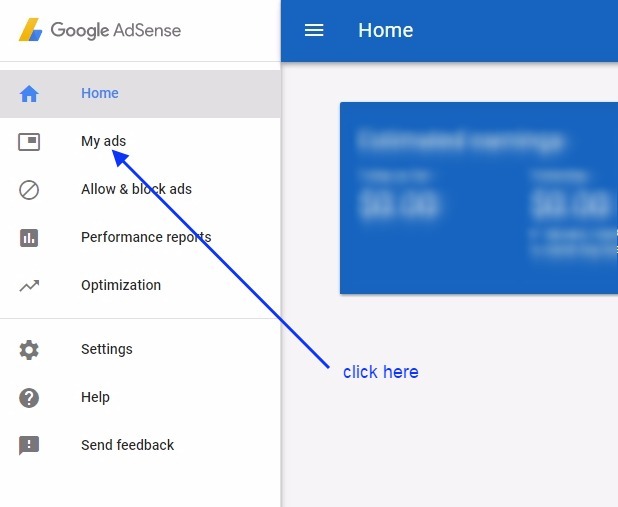 Set & Approve your Google Adsense account Faster. Here you can show the Ads of two types. 1. 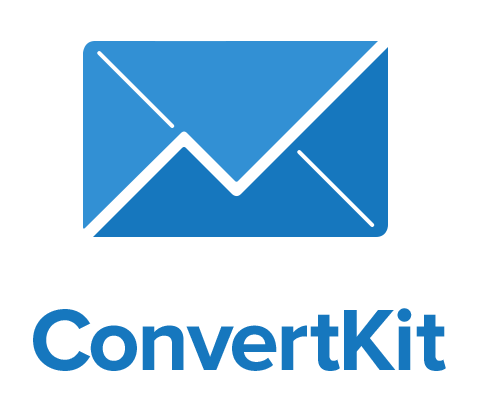 An ad unit that you will create manually, you can create any number of Ad unit. 2. 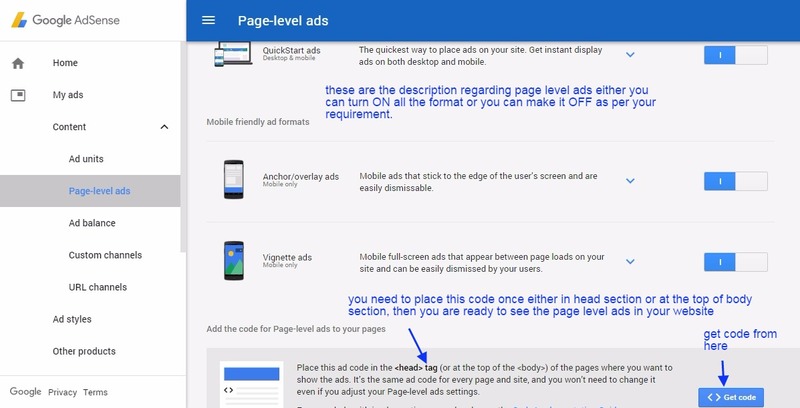 Page level ads, these are the ads which will be shown automatically on your website, here you need to enable the option for different types of page level ads. these ads will be shown in such a way that your content will not get any disturbance from ads. Once you will login into your Google Adsense accounts then you will see the dashboard as shown below. then click on My ads. See the image below. Then click on New Ad Unit as shown in the image below. Here you need to enter the name of your Ad unit. I will suggest you keep the relevant name as if you are going to keep this Ad unit in the header section then you can give the name as head-area. 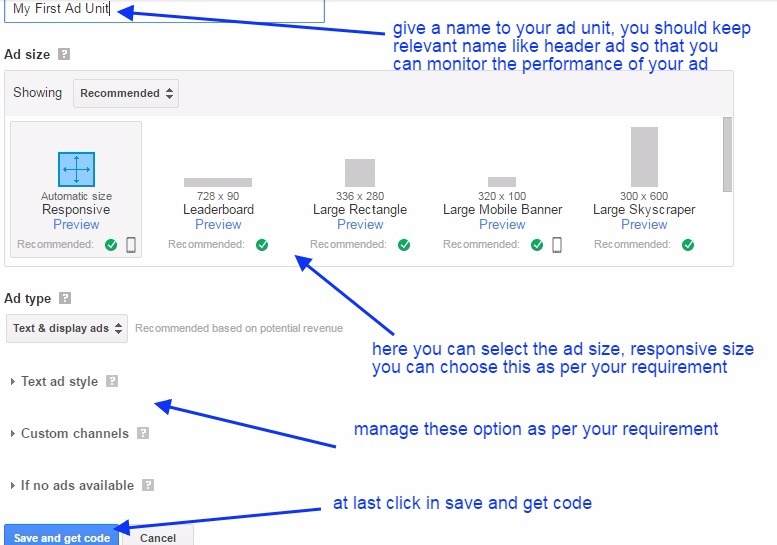 This will help you to check the performance of your all Ad unit. You would easily know that your header area ad doing well or widget area. The second option is Ad size, you should always choose the responsive ad size as they take the position as per the place left or responsive Ad can adjust according to space available. Else you can choose as per requirement. In the next few sets are some formal setting like ad styling and etc. You can explore them and can manage according to your desire. 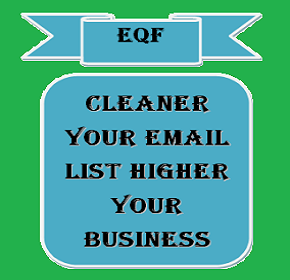 Once you are done with all the formalities then you can save it and can get the code. See the image below. Here you get the code for this Ad type. you can create any number of Ad unit. you should create separate Ad unit for separate part of the website like ads for post, page, widget area, header, body and etc. this helps you to track the performance of your ads. You will see all your ads in ad units. here you can edit an Ad and can rename it, hide it, get code anytime. See the image below. How to set page-level ads….? This is also a very simple process, just follow the steps given below. Click on the page level ads as shown in the below image. Either you can turn On all the page level ads or you can also turn OFF any ads that you don’t wish to show with the option provided with ads. Once you place the code either in the head or top of the body section they start to appear automatically in all the pages or post. they are shown automatically in the page and bottom area as per their configuration. so once place the code and never worry about these page level ads. How to delete Ad unit? You can’t delete the Google Ad unit that you have to create once, instead, you can hide them or rename them if you want to use for the different place. Once you hide them after some time they become inactive. Google Adsense: How & Where to Place Adsense Code in Your Website?